HAYS Cleaning, Inc. is a family owned and operated business that has been serving residential and commercial clients in Chicago’s southwest suburbs since 1979. HAYS Cleaning provides insured, dependable and quality service. We guarantee our work 100%. Our cleaning experience varies from individual homes, move in/move outs, construction clean up, retail businesses, apartment buildings, industrial facilities and office buildings. Call 708-598-3819 to schedule an appointment or a free estimate for services. We have the experience to understand your needs and will tailor a cleaning program that suits each client. We pride ourselves on exceeding your expectations. 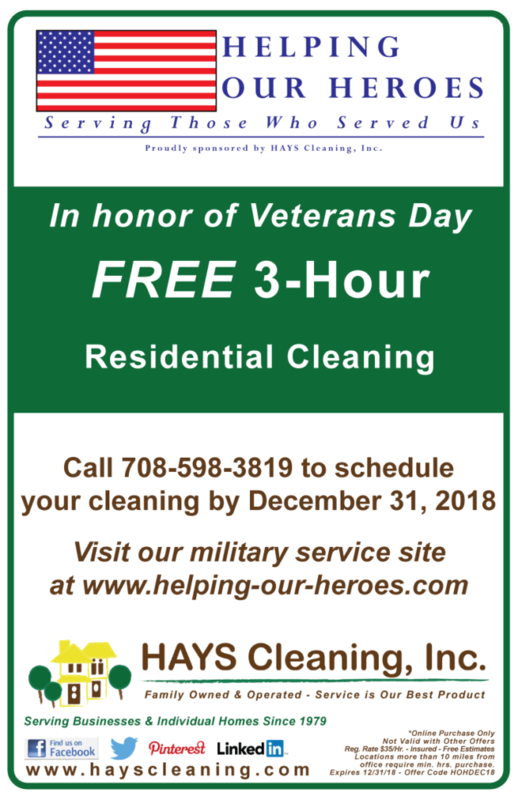 In honor of the veterans and their families who allowed HAYS Cleaning to provide complimentary cleaning services over past seven years, we put together the Helping Our Heroes website. Many thanks to our military families! In 2012, HAYS Cleaning was recognized by “The Fixer” for the Helping Our Heroes Special! This offer provides a complimentary residential cleaning for Veterans of the Untied States Military, spouses of active servicemen and parents of veterans or servicemen. To keep up with the latest news and promotions from HAYS Cleaning, Inc., check out our Special Offers and Promotions pages and become a fan on our Facebook Page.